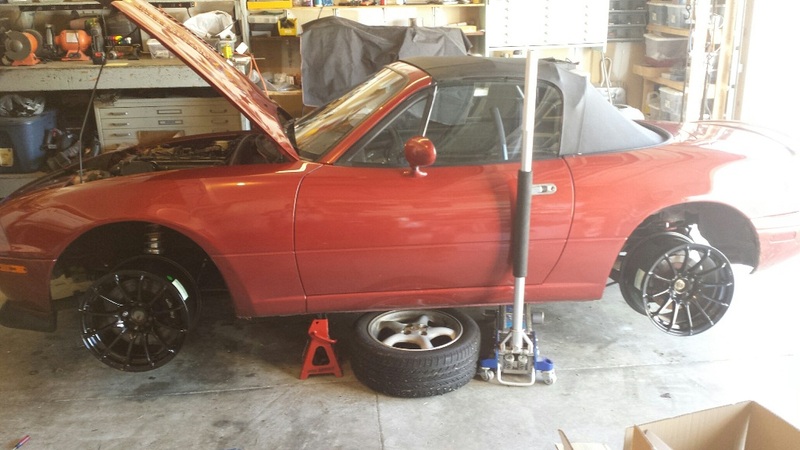 Konig Dial in at discount tire - Miata Turbo Forum - Boost cars, acquire cats. Heads up, just ordered a set of Konig Dial In 15x8 from discount tire direct. 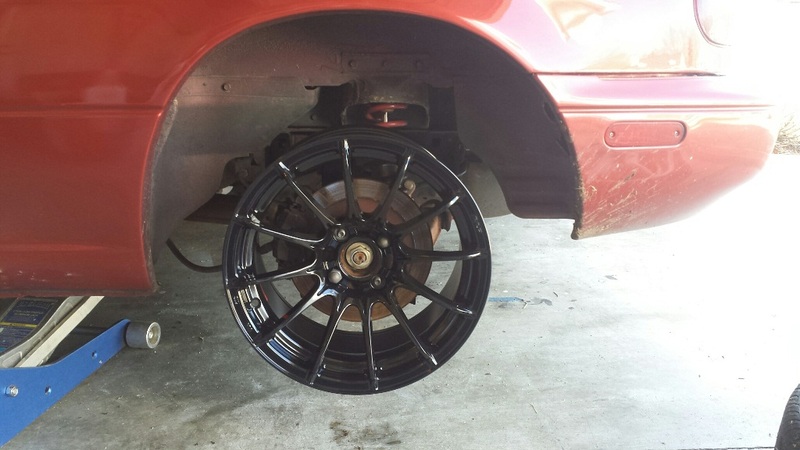 $132 per wheel, -$50 instant savings, -$50 for using their credit card = $432 shipped. They dont have them listed online so you will have to call if you want a set. Thanks for the tip! I called discounttiredirect.com about the Dial In 15x8 and 15x9 and got the 15x9 gloss black wheels for $122 a piece this past week with a mail in $100 visa prepaid card. $388 is a steal. The we're asking the same price for the 15x7 and 15x8 wheels.I don't think the $100 off lasts past the 16th so call them asap if you are interested. Hmmm . . . you could get them mounted with NT01s too. They did have the 225/45/15 NT-01 tires for only $588. Too bad my budget can't pay for them just yet. Can you post some pics of your Konig Dial's? I'm thinking of them though not sure whether to get the gold or gloss black rims. I don't have tires on my 15x9 Dial In's yet, but here are some crappy pics I took when test fitting the wheels. I think its a good looking wheel, but mine were bought for track use with little consideration to looks. Check Good-win Racing 's thread on these in the vendor's section of the forum. Lots of pic in there. Just tried to order a set of 15x9 Dial In + 225 NT01 and they won't sell it. Some bs about stretched tires and lawyers. Weird. My local DT mounts Maxxis 225s to my Advanti 15x9s all the time. I think their automated system raises a flag if you tell them you are putting a 225 tire on a 9" rim. I had to tell them twice that this 225 on 9" wheel was for track use only. They had to have it documented since it is not recommended for street use. Just legal/lawyer crap. If you can't get it figuired out, PM me and I will send you the direct email of the girl that helped me out. She knew what she was doing and got me a great deal! 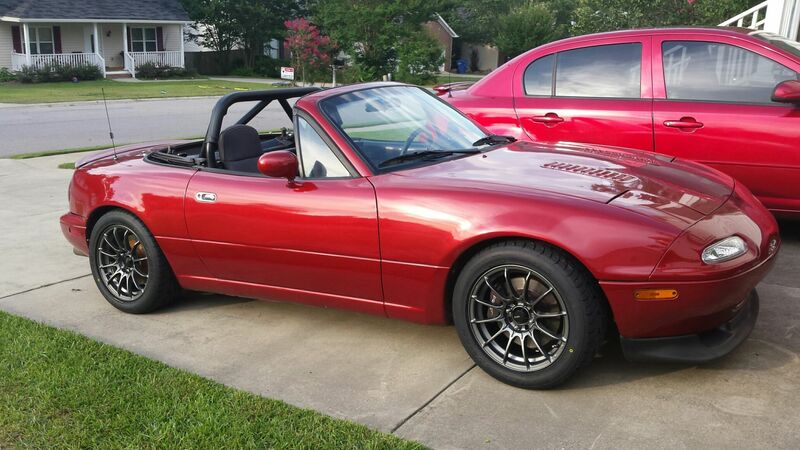 Called in a second time and found someone willing to sell me the wheels, though they are out of stock currently, but absolutely refused to mount 225 NT01 on them even though I stated multiple times it was for race track use only. Eff them. Ordered a bronze set from Goodwin, tires from Maxxis, and lugs/stems from 949. Next CC bill is going to hurt, there's a set of Xidas on there too. I am going to win all of the HPDEs this year. Thanks for the offer but I need something soon and can't wait the extra week+ for out of stock shipping. Rivals are looking pretty bad and I need something before April 11 and I'd like to have them before next weekend for an autox. I didn't have any tires mounted on mine. Just wheels. They wouldn't sell you the wheels and tires unmounted? Discount tire is running the same sale again for 4th of July (June 25-29 promo). I still havn't gotten track tires for the black set of 15x9 Dial-Ins I got in the spring, but at this price I might go ahead and get me a set of black or grey 15x7 Dail-In's for daily use. $488-$100 mail in visa card and -$60 for using their credit card = $328 is a steal for a nice set of wheels. I will pobably get a set of tires mounted by them too, shouldn't be a hassle getting 205s mounted on the 7" wide wheel. I know they wouldn't mount the 225's on the 9" unless you certified it was only for track use. Their search facility couldn't find any 15x8's nor 15x9's... ? Their online chat guys are very helpful. Thanks man I ordered some 15x9's. I finally ordered a set of grey 15x7's today. I got them wrapped in 205 Nitto Neogens for $530 after all the discounts. That makes the cheap basted inside very happy. I still can't believe I got these mounted/balanced and shipped for $530!!! AND they threw in a set of metal hub centering spacers for free. I didn't even ask for them. Looks like that would have been $29 if I bought them seperately. I love Discount Tire Direct! Looks fantastic. I've found DTD pretty hard to beat if you are able to time your purchases. The customer service has been good too.